By Trevor McIntyre: Eddie Hearn wants Dillian Whyte to agree to a deal for him to challenge Anthony Joshua on April 13 for his four titles, because if he doesn’t take the fight, he could lose his #1 ranking with the WBO to Oleksander Usyk. The unified cruiserweight champion Usyk (16-0, 12 KOs) could move up to heavyweight, and the World Boxing Organization will automatically make him the mandatory challenger to WBO heavyweight champion Joshua (22-0, 21 KOs). Usyk still hasn’t made up his mind whether he’ll move up to heavyweight or not. Usyk, 32, still has opportunities for interesting fights against Denis Lebedev and potentially Andre Ward at cruiserweight. It would be a premature move on Usyk’s part if he leaves the cruiserweight division without exhausting all the possible fights that he has in that weight class. If Whyte (25-1, 18 KOs) loses his #1 ranking with the WBO to Usyk, he might have to wait longer for an eventual fight with Jacobs. Last year, the WBO made a similar move recently when they elevated former WBO light welterweight champion Terence Crawford to the mandatory for WBO welterweight belt holder Jeff Horn last summer. With the WBO’s decision to rank Crawford #1 at 147, he was able to leap-frog over the other contenders in the WBO’s top 15 to force a fight against Horn. With that said, Crawford probably would have gotten the fight anyway based on him being promoted by the same promoters at Top Rank, but the WBO’s ranking certainly made sure that there was no wriggle room for Horn, who ended up getting stopped in the ninth round by Terence last June. It sounds like Hearn is using Usyk’s name to get Whyte to accept what many boxing fans feel is a low-ball offer from him. Whyte is pretty clever, and he’ll see through this move by Hearn and judge it for what it appears to be, a strategy to get him to agree to a lesser purse split than he’s asking for to Joshua fight. Hearn is being diplomatic here by not coming out and telling Whyte in blunt language that he lose his #1 ranking with the WBO to the unbeaten Usyk if he doesn’t make a deal to fight Joshua on April 13. Usyk obviously won’t fight Jacobs on April 13, but he could take the fight with him later on this year. In the meantime, Whyte will have lost his top ranking with the World Boxing Organization, and that would hurt his chances for getting the big payday that he wants against Joshua. Some of the problems that Hearn is now dealing with in trying to make the Joshua vs. Whyte fight is his own doing. Hearn helped turn Whyte, 30, into a pay-per-view star in the UK by putting him on Sky Box Office in matches against Dereck Chisora, Lucas ‘Big Daddy’ Browne and Joseph Parker. As you would expect, now that Whyte has become a big name, he now wants a lot more money than what he would have been able to get had Hearn not helped turn him into a star. A 60-40 split for a fight between Joshua and Whyte isn’t unreasonable given Dillian’s popularity right now. It would be in Joshua and Hearn’s best interest to accommodate Whyte, and not drag this out too long. There’s a lot of time for Hearn, Whyte and Joshua to promote the April 13 fight to turn it into something really big, but the negotiations can’t drag on too much longer. Whyte rejected the fist offer from Hearn for a fight against Joshua on April 13 at Wembley Stadium. Hearn then sweetened the offer. It’s unknown how much Hearn increased the offer. Hearn says it’s a “good offer,” but that could mean anything. It could be a “good offer” for Joshua if Whyte agrees to the deal. Hearn keeps stressing the point that Whyte has a chance to win four heavyweight titles, which could be code for, ‘take the small money we’re offering you, because you can win four titles.’ The lure of winning four titles might not be enough for Whyte to accept a deal that he feels is well below what he feels that he brings to the table for this fight. 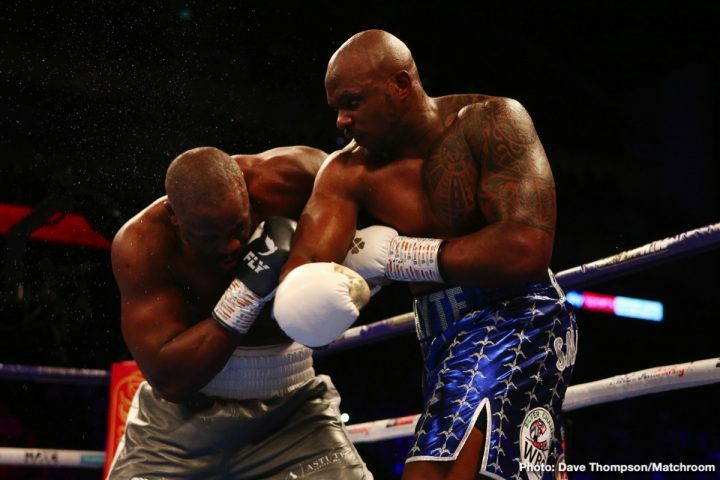 Whyte was in the United States this week, and there’s speculation that he could sign with Premier Boxing Champions, the same management that WBC heavyweight Deontay Wilder is with. If Hearn loses Whyte to PBC, it would be a big loss to his Matchroom stable. Whyte is one of Hearn’s biggest money makers outside of Joshua.